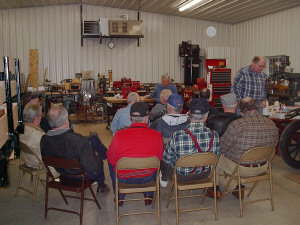 Bob Hollister led the April meeting with 13 in attendance. We had 1 guest beside the regulars. The minutes from the previous meeting were read and accepted along with the treasurers report. Melvin reminded everyone to bring in their aluminum cans to recycle. It may not be much; but, the club does benefit from this effort. Jack updated the club on Paul White's condition. Try to give him a call. If he is feeling up to it, he'll talk with you. Our guest for the evening shared a great story about how he came across the Model T that is currently sitting in Jack's shop. I've transcribed John's story in its entirety at the end of this newsletter. 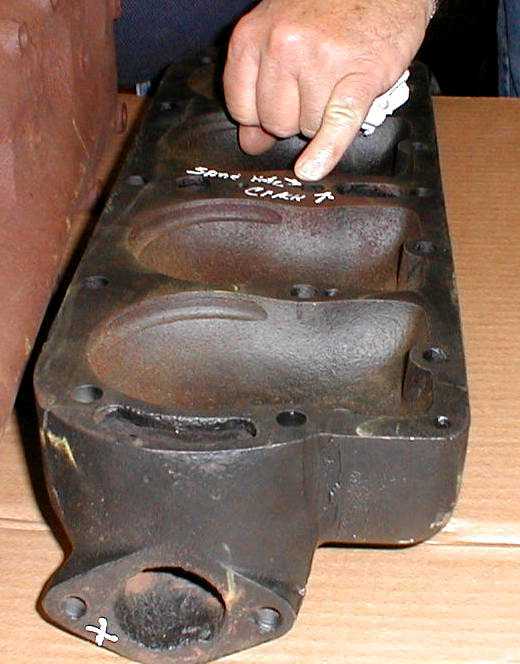 A freak occurance happened on a recent engine rebuild. The head on the right was installed and water was everywhere. It had a crack in an unusual spot. 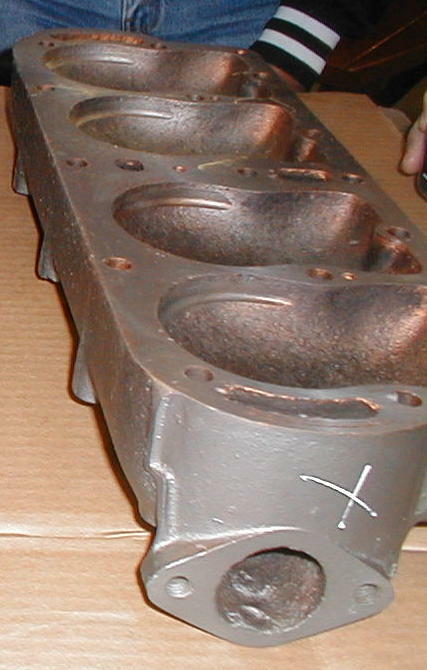 The machined piston clearance ring in the head split at the bottom of the cut. So, the head on the left was installed, only to find that it had a crack around the center water port. The third head worked like a charm. The water crack problem that is not shown is the common split across the outside top. This can occur either along the top at the ridge or across the ridge. These hubs are for the Buffalo style wire wheels. 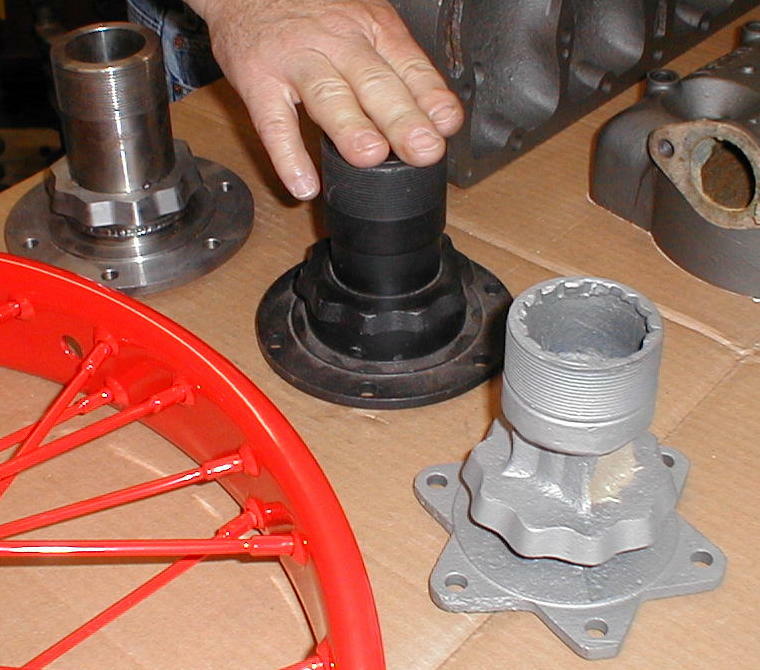 The one on the right is an early style hub, the middle one is of the latter style, and the one on the left is an brand new reproduction Buffalo rear hub. Buffalo style wheels are driven by the convoluted edge most notable on the new reproduction hub, while the Dayton wheel is driven by "pins" which are seen protruding through the wheel center in the second picture. 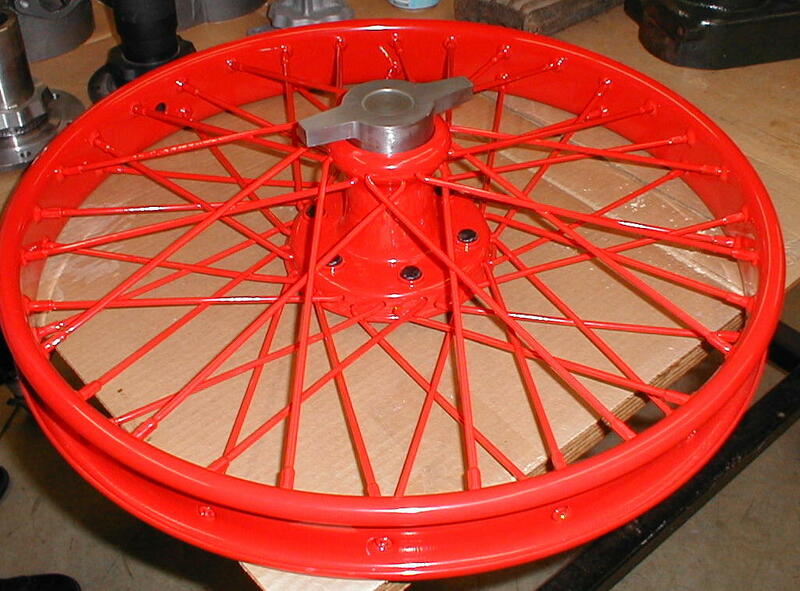 The second picture is a newly powder coated Dayton wire wheel. It has a reproduced knock off hubcap which holds it to its hub. The Dayton hub is being cast at this time and should become a reality in the near future. This next car, a 1926 Model T Tudor sedan, is the first car I ever bought and paid for, on my own. It almost went to the junk yard the day after I bought it because I wasn't quite 16. My dad had set the rule down (he was trying, doggone it) that I couldn't have a car until, (1) I was 16 years old and had a valid drivers license, (2) I had the money to pay for it, (3) the car could be insured and I had the money to pay for it, (4) I had enough money to buy the license plate, the gas and any mechanical up keep needed. Right there you can see a problem. I didn't qualify for any of the four conditions. When I was out riding around on my Whizzer I discovered an old man named Peter Flessa who owned and drove a Model T Ford. He had never mastered the stick shift drive on the more modern Model A so he had to continue driving Model T's with their floor pedal shift. He had a flower garden up behind the Jefferson Grade School where he grew flowers to sell. He would cut a couple dozen bunches of flowers, wrap them in newspapers and load them into the back seat of the Model T and drive to some neighborhood and park. He would go door to door selling these flowers. When they were all sold he would drive back to the garden and start over. He did a lot of sitting under a shade tree next to the garden, too. I saw him driving through town one day and followed him on my Whizzer. Once I found out where he went I often would drive out and sit and visit with the old man. I had lots of questions about Model T's and he enjoyed talking about his. He even allowed me to sit in it. One day he asked me if I'd like to learn how to drive it. You can just imagine what my answer was! After that he sometimes allowed me to drive it around the neighborhood where his garden was as long as he was sitting in the right hand seat. I knew I had to have this car. Thinking about Dad's rule that I had to be 16, I knew I couldn't have it. At the end of the season I didn't see Mr Flessa anymore so I just forgot about the Model T.
One day when I came home from school Mom told me that Mr. Flessa had stopped by and told her that if I still wanted to buy his Model T I could have it for $100. He gave her directions on how to get to his son's farm where he now lived and that he would be home that evening. When I got home and Mom told me about Mr. Flessa I insisted we go right then, as I was afraid someone else would buy it before I got there. I had saved up about $75 working at Schneck's Grocery and for the past few weeks I had been working at Adent's gas station up at the corner of Main and Winchester about half a block from home. I asked Mom to bring another $25 just in case we made a deal. (I knew we were going to make a deal - you don't often get to buy a Model T Ford for $100 and I wasn't going to miss this opportunity). We drove out to the farm and there it was. The Model T had been parked under the barn eaves so long ago that it had sunk into the mud clear up to the axles. The fabric roof was ripped and torn from the ice and snow sliding off the barn roof right on it for one long, bad winter. All but the windshield had been shot by BB guns and the tires were totally flat. I couldn't believe how badly it had deteriorated since I had seen it last and even driven it. I knocked on the back door of the farmhouse and after a while, here came old man Flessa looking like he was a hundred years old. After greeting him I suggested that since the car didn't look like it used to and had a lot wrong with it that maybe he would take a little less for it. He came right back with "how about $60?" I reached into my pocket and pulled out my cash, pealing off three twenty-dollar bills. I had enough of my own money to buy the car and didn't have to borrow any from my folks. I was feeling mighty independent for a fifteen-year-old kid. Flessa went back inside to find the title and Mom and I went back out to the barn to admire my new acquistion . Mom reminded me that I wasn't able to buy a car until all of Dad's requirements were met and I wasn't even 16 yet, another five or six months. I remember her saying "so what do you plan to do now, John?" I suggested that surely Dad would reconsider when he saw how sick this antique looked. 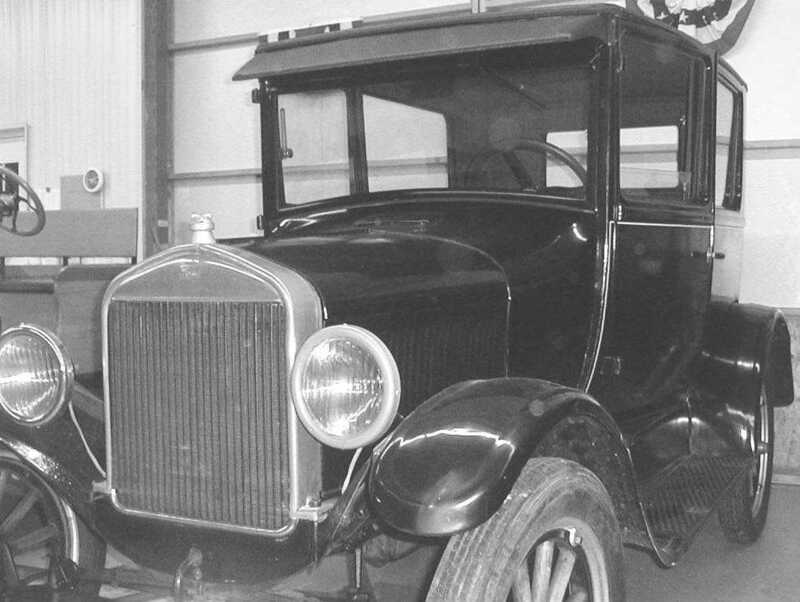 My enthusiasm took a dip when I raised the hood of the Model T. The first thing I noticed was that the generator and the starter and several other small parts were missing. Soon Flessa showed up with the title. He had already signed it. I asked where all the parts were. He said not to worry, they had removed them and stored them in the barn to keep them from being stolen. We walked into the trash and leaf filled barn, me expecting to see several neat card board boxes filled with parts to my 'new' car. There were no shelves much less boxes inside this barn. Mr. Flessa began walking along the base of one of the barn walls, dragging his foot through the old dried out and rotting trash. He said, "I know that stuff is along here somewhere." Mom and I joined him in the search. It took maybe half an hour but eventually we found all of the parts I thought were missing. These we loaded into the trunk of the '36 Chevy. Mom and I went home and she started dinner. I went up to Adent's gas station to ask Butch if he would drive me and his wrecker out to bring back my prize the next day which was Saturday and I didn't have to go to school. Butch was a big curly-head guy and he had a wonderful laugh which I got full benefit of for the next two of three minutes. He knew my Dad's four conditions and he knew I was in for some serious yelling if he brought that Model T to my house. I had other plans. Not only did I need Butch to fetch my car but he had to allow me to hide it behind the gas station building to make this work. Finally he agreed to this plan with much misgiving. The next morning Butch and I went back out to Mr. Flessa's farm and started to pull the Ford out of the mud. Of course I had understated the situation in order to get his help. I heard about that, too. We put a dolly under the back end of the Ford and the hoist carried the front end and pulled her back to the gas station . Butch backed her back in a corner and set her down. I had unloaded all of the loose parts from the trunk of Mom's car back in the corner as well, earlier. It was awsome! I mean, here I was looking at my very first car. It was all mine and I had paid for it. And I was only 15! Darn, I was only 15, what was I going to do about that? I can't just let it sit here until I'm 16 and then tell Dad. What to do? I began fooling around re-attaching the loose parts. The starter, the generator, the coils, the battery, etc. In a couple of hours I had most of the important stuff bolted back on. Just for the fun I installed one of the junk traded in batteries and hooked up the battery charger. Then, also just for fun, I stuck the car wash hose into the neck of the radiator. I discovered the oil in the engine was low so I filled it with drain oil. The urge to try and get it running was over powering. I got it started!! Again, awesome. The engine was running , water was running out of the radiator almost as fast as it was flowing in, and the junked battery was actually retaining some of the charge. The pressure to test drive this Frankenstein over took my judgement. The test would be to drive it around the block, once. Back it back into it's corner and go about my business of trying to figure out a way to tell Dad. The first problem was that to drive around the block I would have to drive right by my house. By now it was Saturday afternoon about 2:00 o'clock. I knew that on Saturday Dad always went downtown to the Elks Club to play a few hands of poker with the boys. This was his weekly time for himself. Every Saturday! He usually didn't get home until 3:30 or 4:00 PM. Plenty of time. I could make a lap around the block in ten minutes providing the Model T didn't stop on me and even if it did I had a copule of hours to drag it back to the station and hide it. I unhooked the car from the wires and hoses and pulled out onto the driveway. I had to remember all of the tasks to make a Model T run before actually getting into the street. I pulled down the gas lever and pushed down on the low gear pedal, I was off and running. The roof fabric was so torn that it flapped behind me like a bunch of banners. I didn't care, I was now driving my own car! Horror of horrors, my Dad just happened to be sitting on our front porch reading the paper. I was caught! I thought I might just be able to sneak past without him looking up. I pushed up on the spark lever (instead of the gas lever) causing the Model T to backfire. Dad looked up and saw me! I was dead. I gave it more gas and quickly turned the corner and headed back up to the gas station as fast as I could. I guess I was going to try and abandon the car and and make a run for it. Didn't work that way. By the time I was back at the gas station Dad was waiting for me to arrive. I didn't know he could run that fast! I backed the noisy, steaming, ragged Model T back into it's corner and got out. Dad was mad as hell but he was calm, thank God. His message was very clear, "Monday morning this piece of crap goes to Lausman's first thing. Until then, you will not do any more to it but remove Butch's battery and clean up this mess. Then you will report home for the rest of this conversation." I knew the jig was up. Owning my own car didn't last as long as I had hoped. I began begging like a world class actor. Butch, by this time, had joined us. He knew I was up to my neck and wanted to see how I was going to get out of this jam. I asked Dad to consider that this car was a valuable antique and would be worth a fortune some day if I was allowed to store it in our garage until I was old enogh to restore it, etc. I must have covered that argument pretty well because finally dad agreed that if I parked it in the back yard and promised not to touch it until I could satisfy all of the four conditions it could be saved. Then Dad started to laugh. He turned to Butch and said something like "that has to be the worst looking car I ever saw!" That has to be why I have kept that 1926 Model T for all 52 years so far. This snapshot shows the car as it is today in Jack Putnam's shop for and engine look-see. Over the years we have restored the car three times.